This summer, University of Illinois Extension Master Gardener volunteers will provide programs in the Master Gardener demonstration gardens. On Thursday, June 9, at 5:30 p.m., Master Gardener volunteers will discuss "How to Grow and Harvest Horseradish." Roots of the horseradish plant are harvested and grated to become a flavorful addition to several food dishes.Presentations will last approximately 30 minutes followed by a question and answer session. 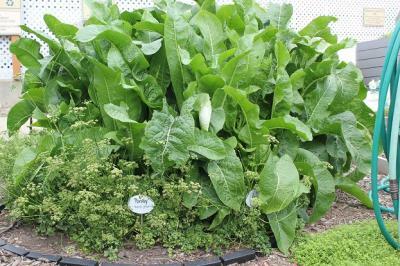 Ever wonder how horseradish grows? Actually, one of the most favorable locations for horseradish cultivation is in Illinois where this perennial is grown as an annual row crop. Commercially, roots are planted each spring and dug up and processed in late fall. Collinsville, Illinois celebrates this herb each June with the International Horseradish Festival which features various food products flavored with the root, including many "wasabi" flavored foods. In the home garden, horseradish roots shoot up large 1' leaves in the spring. During the summer, the plant spreads underground well beyond the original planting. Harvest is typically around the time of the first frost. No matter how many roots are dug at that time, the cycle begins again the next spring with new plants ready to take over in the course of the growing year.